The largest park of North West holiday park operators, South Lakeland Parks has achieved its first ever 4-star rating from national tourist board, Visit England. 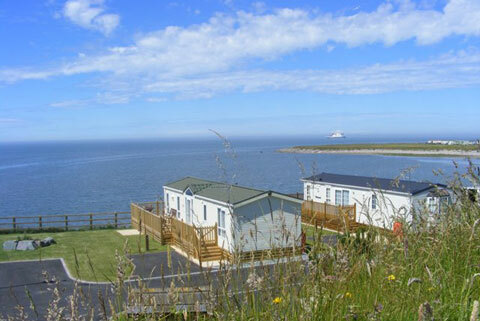 Ocean Edge Holiday and Leisure Park in Heysham on the edge of Morecambe Bay has been awarded the prestigious four stars for the first time in its history. The Visit England assessors were particularly impressed with the hard work of park manager Jonathon Hodson and all his staff to raise quality in a number of essential areas over the past couple of years. Particular attention was paid to the “excellent level of upgrades noted this year including new toilets, showers and changing rooms plus fire points and lighting.”In the last three years, despite the challenging economic climate, Ocean Edge has had half a million pounds worth of improvements carried out including; new low energy on-park street lighting; extensive upgrading to toilet, shower and changing areas as well as the refurbishment of the children’s play area and café; and new bus shelters offering complimentary bus travel into Morecambe town centre. The main complex at Ocean Edge has been refurbished to add a new sauna and disabled access to the swimming pool and changing areas and some of the park’s pitches have also been redeveloped. All of this investment took place at a time when there could potentially have been a great big question mark hanging over the future of the park. Until recently, one of the sites earmarked by the Government for nuclear new builds was Heysham, which could have had far-reaching consequences for the park. Nigel Wimpenny, Managing Director of South Lakeland Parks of which Ocean Edge is one of nine parks, said: “Jonathon and his team should be very proud of all their efforts and this extra star is testament to that. In today’s competitive industry, we know that four stars are not easy to attain – it does take a lot of extremely hard work to get them. I’m so pleased to say that Ocean Edge will now become the eighth of our nine parks to have a minimum of a 4-star rating. Holidaymakers and holiday homeowners can rest assured that they will receive first class service, excellent value for money, and enjoy first class facilities when staying on Ocean Edge. “The hard work does not end here though and we will still continue to invest in Ocean Edge and all of our parks. Our next development at Ocean Edge will be the addition of some brand new primecliff top pitches boasting uninterrupted views over the Irish Sea, which look set to become some of the most exclusive pitches on the park.” Ocean Edge Holiday and Leisure Park is situated in a peaceful location on the Southern edge of Morecambe Bay in Heysham. Despite being the largest of the group’s nine parks, it has the lowest comparable site fees across all holiday parks in the North West of England. For more information on Ocean Edge and all of South Lakeland Parks, visit www.oceanedgeleisurepark.co.uk or www.southlakelandparks.co.uk.